Have you guys heard?! 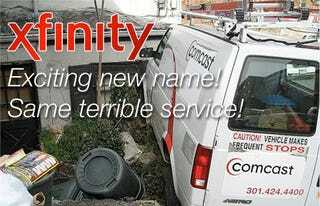 Comcast's brand is so irreparably tainted by their horrible service, they're changing it to Xfinity! Yes, Xfinity. Hilarious! Let's help them transition by making some ads for them. Comcast Rebrands Itself as Xfinity. Seriously? That&apos;s... That&apos;s All You Got? Send your best entries to me at contests@gizmodo.com with Xfinity Ads in the subject line. Save your files as JPGs or GIFs under 800k in size, and use a FirstnameLastname.jpg naming convention using whatever name you want to be credited with. Send your work to me by next Tuesday morning, and I'll pick three top winners and show off the rest of the best in our Gallery of Champions. Get to it!